Thank you to all who logged on and participated in the webinar January 20. 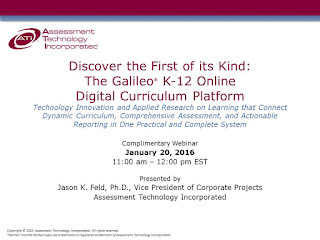 During the webinar, Dr. Jason Feld demonstrated the next generation of Galileo K-12 Online technology, the Galileo Digital Curriculum Platform. The platform is a practical and complete system that supports a seamless integration between standards-based instruction, balanced assessment, and Dashboard reporting to promote learning. To learn more, watch the webinar recording or contact a friendly ATI Field Services Coordinator. Each item in our extensive item bank libraries is written to exacting standards of review and certification by in-house subject-area experts. Our writing and review process ensures that the assessment content is accurately aligned to the standards. ATI’s development of item specifications and diverse item types allows districts to administer assessments that address their particular needs in student measurement. Statistical data is collected on test items to confirm the validity and reliability of the measurement. Parameters on difficulty, discrimination, and guessing inform student developmental level scores that districts can use to predict performance on state-wide tests and to inform intervention efforts in the classroom to improve that performance. Items in ATI’s Galileo K-12 Online item banks are linked to Depth of Knowledge and item specification documents. Texts used in the item banks are aligned to Lexile® Measures and Flesch-Kincaid readability scores. The items are evaluated relative to released items from national consortia and state-wide testing instruments to ensure comparability. Additionally, ATI offers item types and content beyond what is offered in state testing instruments to afford districts diverse and customizable measures of instruction and learning. Item banks feature more than 75,000 items linked to current state standards. Item banks grow by over 800 items per month. More than 15 distinctive item types including interactive text, drag and drop, open response, and multi-part. Item banks feature more than 10,000 Technology Enhanced items. Content covers K-12 ELA, math, and science. Secure assessment content for district-wide use and community assessment banks for classroom users. Additional user-created content available in non-state tested subject areas. Recognizing the importance of integrating dynamic digital curriculum with research-based assessment, ATI has developed the next generation of Galileo K-12 Online technology, the Galileo Digital Curriculum Platform. Built on the foundation of ATI's nationally recognized Research and Development Program, the platform creates a seamless integration between standards-based instruction, balanced assessment, and Dashboard reporting to promote learning. 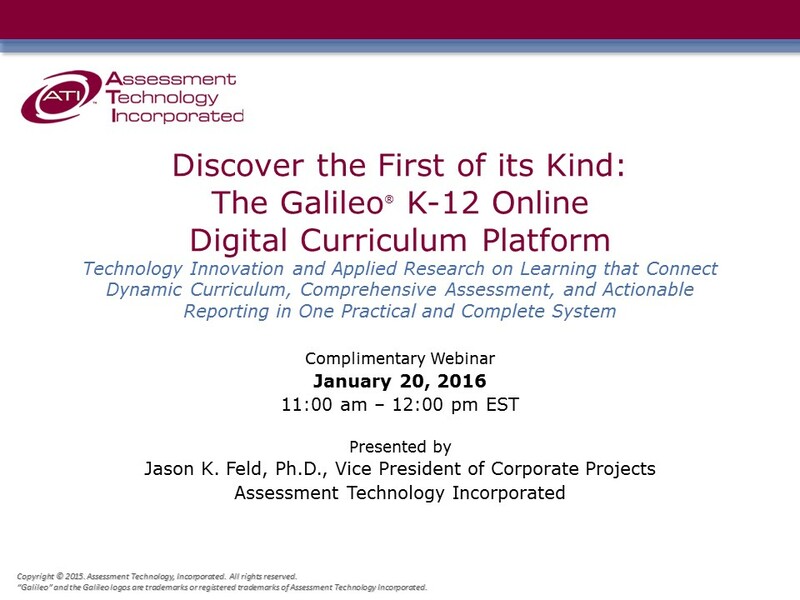 Please register to join Dr. Jason K. Feld, Ph.D., with ATI for this complimentary webinar on Wednesday, January 20 from 11:00 am to noon EST to examine innovative technology that connects dynamic curriculum, comprehensive assessment, and actionable reporting into one practical and complete system.